After a long tour of the secluded Florida Panhandle a few weeks earlier, much of southwest Florida was quite a contrast, especially Sanibel Island and Captiva (inbetween Tampa and Naples). While certain portions were declared state preserves in the 1990s, most beaches were built on and not available for public access; the few public beaches had $2/hour parking, if you could find parking at all (I got used to empty parking lots on the panhandle beaches). Sanibel Island had inspiring photos of its beaches from the early 1980s that drew me to visit; but that exotic, tranquil, untouched island from thirty years ago was long gone, built over by second homes for the weathly during the housing bubble ten years ago. Welcome to Florida in 2011. The trip was very educational, however. Sanibel and the rest of Southwest Florida were loaded with fun facts on informative signs put up by the National Park Service. Here are a few. Sanibel Island is one of the few east-west island in Florida, which apparently allows a huge amount of impressive sized shells to land on the beach; and I noticed them everywhere. Many locals and tourists were out with buckets picking them up those shells each morning. One nice part of Sanibel was JN Darling National Wildlife Refuge, an undeveloped mangrove ecosystem that is well known by birding enthusiasts for its diverse migratory bird populations. The groves themselves are interesting, but not quite as large as those I’m used to seeing further south. I walked the trails and photographed the mangroves, but it was too late in the day to rent a kayak; I’ll eventually come back and photograph the main water-trail. 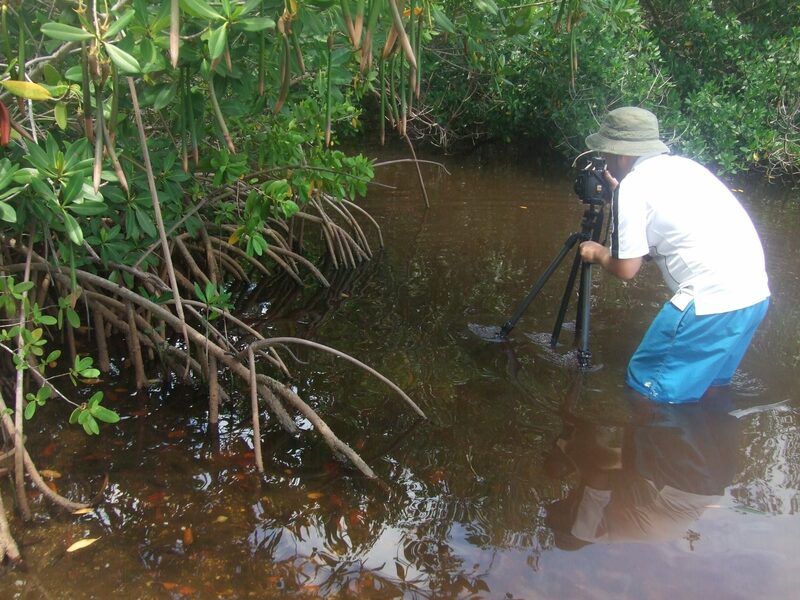 Mangroves have become smaller and more endangered in Southwest Florida because of over-building in the earlier 2000’s. 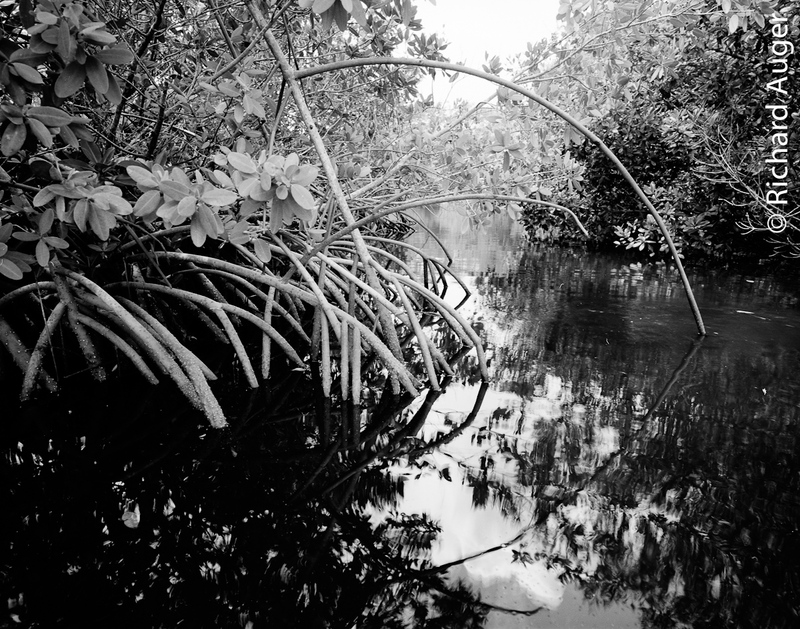 Mangroves along the Indigo Trail at JN Darling Wildlife Refuge, Sanibel Island Florida. By Richard Auger. I was somewhat to relieved the crowded island, and prepared to drive to Estero and Bonita the following day. Two gems in the area were Bonita Springs and Estero islands, just south of Fort Myers Beach. Lover’s Key in Estero was by far my favorite. I arrived during a heavy thunderstorm, and walked the entire beach with my camera sealed in a Pelican case. At 9:00AM on Estero, with a heavy rain and foggy mist, the beach was completely deserted, with views of the ocean and nearby islands obscured, along with a few driftwood trees in the water along the northwest corner of the island. The sand was soft and white beneath an even spreading of red mangrove seeds, which look like large, brown versions pea-pods; they float from JN Darling’s mangrove forests and made their way to the surrounding islands to help spread the growing of mangroves along the coast. The seeds made the sand appear darker and more interesting. Many signs gave notice not to swim; not for environmental protection or safety, but liability protection for the park, as the current can be quite strong. During the rainstorm, I jumped in the water to cool off, and stared off to the islands in the distance, waiting for the clouds to clear. When the thunderstorm stalled and began to break apart, I shot a series of photos along the beach for the next hour. Lovers Key, Estero, Florida. TMAX 100 in Tmax Dev. By Richard J. Auger. As the sun emerged and the clouds moved on, I could finally see the the island across the way stuffed with condominiums and luxury hotels. The feel of the deserted beaches were gone, although still empty. I had a long walk back to the car, and I began to see jet ski’s and boats at full speed zipping between Sanibel and Estero Islands. Several shell collectors with large buckets were raiding the beach on my long walk back. It was still early enough to drive down the rest of the coast down to Collier County and through the Tamiami Trail. Lovers Key State Park. The northwest tip of the island has a lighthouse. Photo by Richard Auger. Driftwood on Lovers Key State Park, Florida. The beach varies as you walk around the island, going from shells and dark sand to light sand with driftwood here.